March 22, 2010 - On Saturday two small planes a single engine Piper PA-32 and an RV-6 experimental home-built aircraft collided over Levy County Florida near the Williston Municipal Airport about 85 miles north of Orlando at about 11:51 AM. The pilot and passenger of the Piper aircraft have been confirmed dead along with the pilot, a 73-year-old man of the RV-6 experimental home-built aircraft who has been identified as Lee Hanley Sentman III, 73, of Summerfield. The identities of the pilot and passenger of the Piper aircraft have not been released. The Piper PA-32 is is owned by Aro Wings LLC out of Morriston, Florida. Lee Hanley Sentman III was a professor and Director of the Chemical Laser Laboratory at the University of Illinois. He had a Ph.D. Aeronautics and Astronautics, Stanford University, 1965 and B.S. Aeronautical Engineering, University of Illinois, 1958. The Chemical Laser Laboratory that Sentman worked was involved in developing the fundamental understanding of the fluid dynamic, chemical kinetic and radioactive interactions that determine the performance of continuous wave chemical lasers. Levy County Sheriff's Captain Evan Sullivan indicated that the Piper aircraft was so badly burned it took police officials a while before they could determine that there were two bodies in the aircraft "One was totally burned." Williston, Florida-Debbie Phillips a resident of Court Williston called the Levy County Sheriff's Office and stated that she heard what she thought was a gun shot, but when she looked out her window she discovered a plane had crashed in the field behind her house. Levy County Sheriff's Deputies, EMS and Williston Fire Department responded to the scene and discovered an experimental small airplane upside down approximately 300 yards from the above residence. 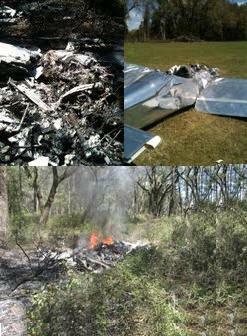 Deputies confirmed that a 73 year old white male was deceased in the experimental airplane. Upon further investigation a second airplane a Piper PA-32 was discovered fully engulfed in flames approximately 400 yards to the west of the experimental plane. The Williston Fire Department extinguished the fire with water and foam and discovered two unidentified bodies in the second airplane crash. Preliminary investigation reveals that the experimental airplane left the Ocala Airport this morning and the Piper PA- 32 left the Williston Airport. The two had a mid air collision around 11:45 AM and the weather condition was sunny with clear skies. The Emergency Management Community Emergency Response Team (CERT) assisted at the scene which encompasses an area that is approximately ? of a mile long and ? of a mile wide. The Piper PA-32 Cherokee Six is a series of six or seven seat, fixed landing gear, light aircraft, that was manufactured in the United States by Piper Aircraft between 1965 and 2007. The Federal Aviation Administration investigators are also responding to assist in the crash. The flight plan and circumstances of the crash are unknown at this time. No identifications will be released until the next of kin are notified.